The start of summer marks the start of training season for fall races, so I thought it would be a good time to tell the story of how I went from the Couch to Dopey Challenge in one year. I turned 40 in November 2012 and was about 30 pounds overweight. I resolved to get into better shape right after the Christmas (eating) season. 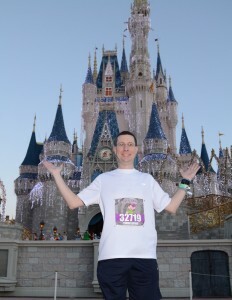 But I had a “stretch goal” of running the Walt Disney World Marathon. Running through all four parks (but mostly Cinderella Castle) seemed like a dream to me. It took a lot of work, a lot of luck and a lot of help from others. I hit the treadmill for the first time in many years, running 30 minutes at lunch. Each day I marked a red X on my calendar to designate that I ran, and I tried to keep the weekday streak alive. Running about 2.5 miles/day or 12 miles/week. I got fitted for “real” shoes at a running store, settling on the Nike Vomero 7’s. I would own five pair of the same model before the year was out. By the end of the month I was running close to 3 miles/day with a couple of longer runs of 4-5 miles. It’s amazing how short that seems now but at the time it seemed so long! I also started listening to the Mickey Miles Podcast. Using the Jeff Galloway Training Plan for the runDisney Wine & Dine Half Marathon, I started to slowly increase my mileage, but I wasn’t using run-walk-run. I peaked at a long distance of 9 miles and developed plantar fasciitis. It was my first injury and my first real setback. I took a couple of weeks off to heal. After hearing Team Studios Central featured on the Mickey Miles Podcast, I contacted Team Captain Aaron Del Prince and joined. Back to running, but this time using run-walk-run (3 mins/1 min intervals) and increasing my mileage more gradually. I decided that my new mantra would be “no injuries.” I signed up for the Dopey Challenge (running the Walt Disney World 5k, 10k, Half Marathon and Marathon on four consecutive days) theday registration opened. It sold out just a few days later. I ran my first race, the Flower City Challenge 5k and finished below my goal time, but more importantly, I learned the mechanics behind a race: how to pick up a race packet, the logistics of getting to a race early and keeping warm waiting for the start, how to position myself among the runners at the start and maneuvering around slower runners during the race. Running 15-20 miles/week, usually 4-6 miles/day. I registered for the Wine & Dine Half Marathon and Jingle Jungle 5k, and built an Excel spreadsheet to carefully map out my training through the end of the year, using the Galloway Training Plan. I added several races along the way to serve as checkpoints and add to my experience. I ran the Lilac 10k in Rochester, aiming for a sub one hour time to submit to runDisney for better corral positioning for Wine & Dine. I finished in just under 59 minutes, with the same mantra: “no injuries.” Averaged 4 miles/run and closer to 20 miles/week. Running five times/week, slowly increasing my weekend long run to 10 miles, increasing weekly mileage to about 25 miles/week. 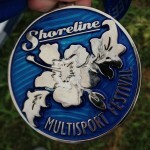 I ran my first Half Marathon, the Shoreline Half. I was admittedly under trained at that point, so I treated it as a training run. I ran a training pace throughout and finished in 2:27 with no injuries. Maintained my average weekly mileage in the 25-30 miles/week and increased my long run to 12 miles. I aimed for a September half-marathon to run aggressively to ensure good corral placement for Dopey. Conditions were perfect for the Rochester Half Marathon and I had been eating well and tapered well so with fresh legs I finished just under 2:07, knocking 20 minutes off my time from two months prior. This would be the last race I would run hard. From here to the Dopey Challenge I vowed to take it easy, increasing mileage slowly and safely. Reduced run-walk intervals to 2 mins/1 min. Weekly mileage close to 30 miles/week. Continued extending my long run and did my first Dopey Challenge simulation, running 3-6-9-18 miles by the end of the month. Started to really feel like I would be able to complete the Dopey Challenge. Ran the Jingle Jungle 5k and Wine & Dine Half Marathon on the same day. I felt pretty bad for the second half of the half marathon, with a mounting headache and stomach cramping. I had spent too much time on my feet in the parks, hadn’t been getting enough sleep (about 10 hours over the previous two nights) and hadn’t been eating right. I learned so much from the experience – I knew exactly what NOT to do during Dopey. Finished a 20 mile long run in freezing rain to complete another Dopey Challenge Simulation of 3-4-10-20. My longest mileage – up to 40 miles in a single week. Harsh weather moved most of my runs to the treadmill. Cut short my final Dopey Challenge Simulation after 3-6-12-11 with foot pain starting to come on. I didn’t want to risk injury just a couple of weeks before the Dopey Challenge, and I was confident I could complete the challenge. Drawing from my Wine & Dine experience, I stayed out of the parks and off my feet as much as possible. I ate well – chicken and vegetables mostly. 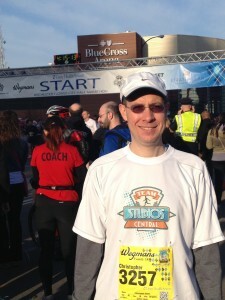 I ran the 5k and 10k at a very easy pace, stopping for many pictures. I was convinced at the Mickey Miles Podcast Meet Up to try a 30-30 interval for the Half Marathon, which I used to much success. I used the 30-30 again in the Full until about mile 22. Tightness in my quads forced me to walk more than run but I finished with a smile on my face and ready to do it again! I purposely scheduled races of increasing distance throughout the year. It gave me milestones to shoot for and increased my race experience. I was pretty disciplined about sticking to my training plan. Going from couch to the Dopey Challenge is an aggressive goal, and taking a month or two off would have probably meant failure. I kept track of everything. It’s satisfying to look back and see how far I’ve come, but it’s also helpful to keep yourself accountable. I didn’t worry about speed, other than trying to run the September Half Marathon fast. I focused on increasing my mileage and avoiding injury. An injury would have sidelined me for weeks and probably meant inability to get sufficient training miles in before the Dopey. I bonked at Wine & Dine but learned so much from the experience. It’s OK to fail or make mistakes – as long as you can learn from them. If I hadn’t learned what not to do at W&D – I probably would have made the same mistakes at Dopey. I was lucky to have met some great people through Team Studios Central and at the Mickey Miles Podcast meet up. Their advice on running the Half, and guidance and camaraderie while running the Full helped me finish strong. 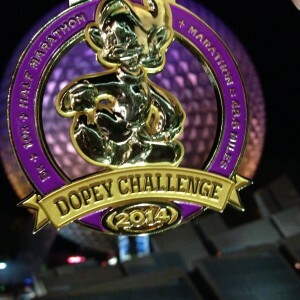 If you’re considering going from the couch to the Dopey Challenge, it’ll take a lot of work, some luck, and a little help along the way. 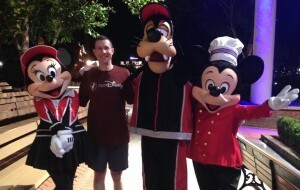 You might be on your own for the first two, but consider joining the Mickey Milers if you’re looking for a great group who loves having fun at runDisney events! I would not have made it without you and my other teammates! Can’t wait to repeat all the pain in 2016!